Mark Blumberg will be coming to speak about his book, Freaks of Nature: What Anomalies Tell Us About Development and Evolution, published in 2009. Dr. Blumberg is a behavioral neuroscientist and professor at the University of Iowa. The lecture/reading will be followed by a book signing in the main lobby. Book signing and reception follows program. You can find out more, and register, by clicking here. You can also find out information about this event, and many others, on the nascent Morbid Anatomy Events Calendar. This calendar is still under development; I would love feedback and further event submissions. Click here to view calendar; email me here with submissions or comments. 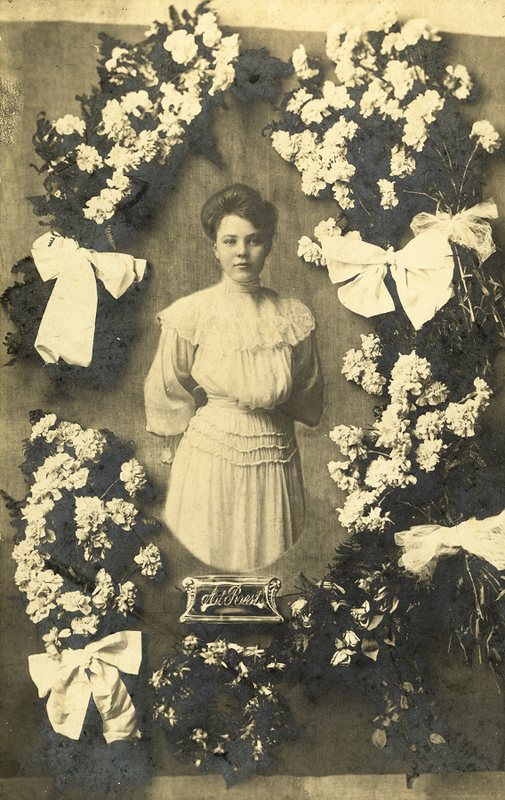 I just stumbled upon a delightful post on the topic of Memorial Photography on Metafilter. The post links to several websites, my favorite of which is the Flickr collection of "Jack Mord," the man behind The Thanatos Archive, which, by an odd coincidence, I just became a member of yesterday on the recommendation of John Troyer of Death Reference Desk; so far, it seems well-worth the $25 yearly fee. 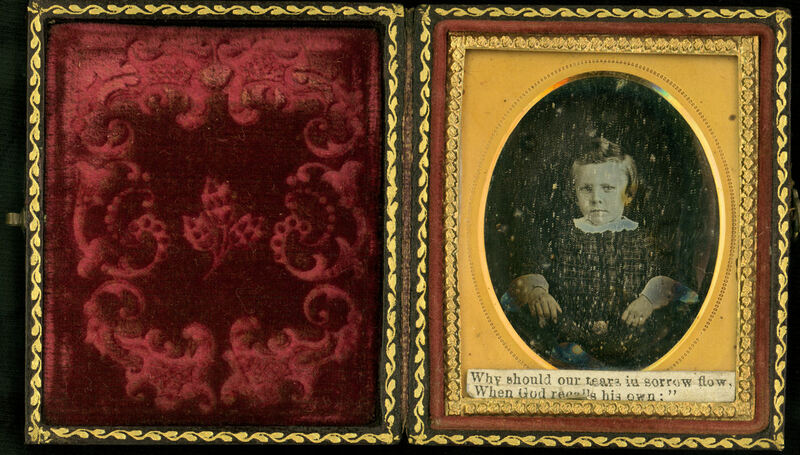 The Thanatos Archive, in the words of the homepage, is a repository for "an extensive collection of vintage post mortem and mourning photos dating back to the mid-1800s" while also being an online-community for collectors and enthusiasts. Highly recommended. Click here to visit the Metafilter post. Bottom four images from from Jack Mord's Flickr set, which you can visit by clicking here. 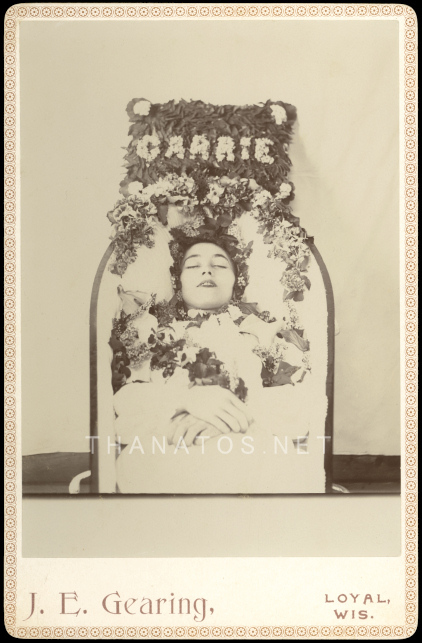 Top image from The Thanatos Archive, which you can preview and join by clicking here. For more on this topic, see these previous posts: 1, 2, 3. Click image to see larger version. For more on phenakistoscopes, click here. Found on the la Meduse et le Renard website. I just stumbled upon the rather wonderful artwork of contemporary artist June Glasson. You can view her "Foulest of Shapes" series--all ink-on-paper drawings--by clicking here; The above images are all drawn from that series. Found via the ever-revelatory Wurzeltod Tumblr; Click here to see more. 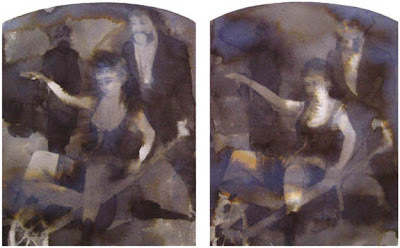 "Melancholy," by Mike Robinson, 2003. 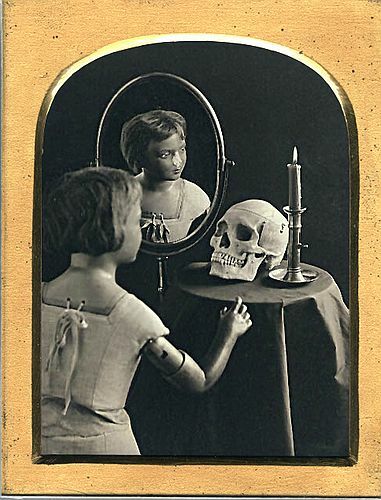 Quarter Plate daguerreotype of a dress mannequin circa 1917 with skull. Created in collaboration with Spring Hurlbut and created for exhibition at the Art Gallery of Ontario in Toronto. You can see more of Mike Robinson's work here. Image sourced from here and originally found here. The Coney Island Amateur Psychoanalytic Society was a unique organization which flourished from 1926 through the early 1970s. Members, most of them working people from a wide variety of cultural backgrounds, were filled with the desire to participate in one of the great intellectual movements of the 20th century. 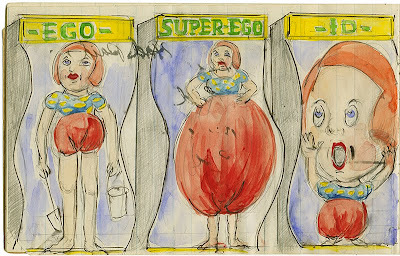 The exhibition currently on view at the Coney Island Museum presents a range of their activities which reveal an incredibly brave, unapologetic exploration of their inner lives. Beloff and Beebe will present an overview of the work of the Society including the long lost “Dream Films”, the Sunday lectures, plans for Dreamland and the controversy over the lost “Sigmund Freud” figure at the World in Wax Musée. The book/DVD “The Coney Island Amateur Psychoanalytic Society and their Circle 1926-1972″(more on that here) published by Christine Burgin (June 2009) will be available for purchase. To visit Zoe Beloff's website and find out more about her work, click here. 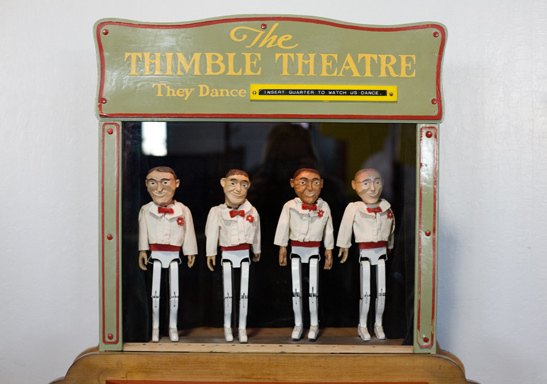 Click here to visit The Coney Island Museum website. For more about Observatory, click here. Just last night, two friends (and collaborators) were asking me where they should go on their upcoming trip to San Francisco, where I grew up. 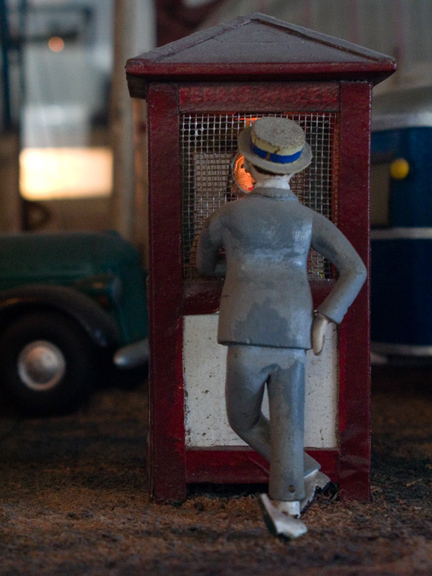 Without even thinking I responded only this: Musée Mécanique. Which is not to say that San Francisco is not filled with lovely and amazing things, not to mention food! But still, to me, Musée Mécanique a standout; It is by the most interesting, idiosyncratic, and magical place I know in the entire Bay Area. 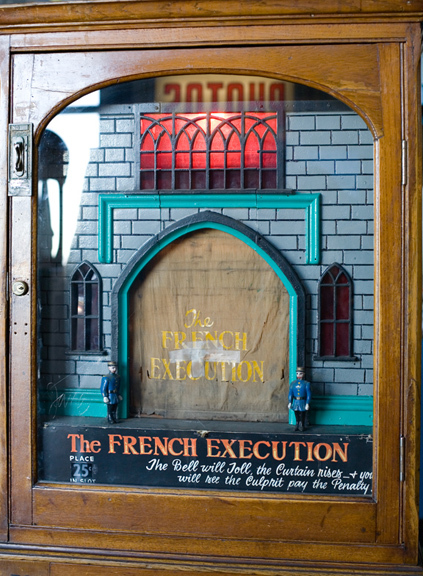 The Musée Mécanique is a museum that houses scores of mechanical toys ranging from Victorian penny arcade toys to automata to early 20th Century fortune tellers to pioneering forays into animation to 1980s video games, all collected by San Francisco resident Edward Zelinski. 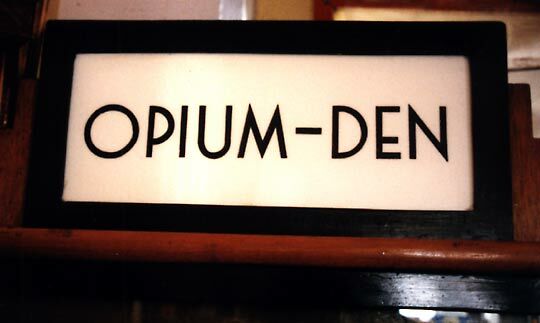 Within these walls you can see: an opium den's inhabitants luxuriating in their lair, a drunkard's delirium tremens-inspired dreams, both a French and an English execution scene (!!! 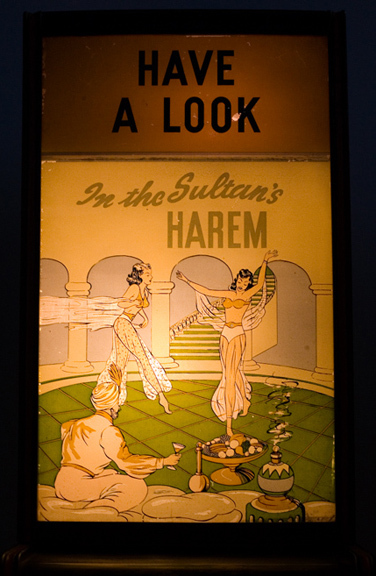 ), a sultan's harem, dancing monkeys, the famous "Laughing Sal," and an epic, ambitious 1930s fairgrounds scene rich in colloquial detail complete with freak show and a angry caged gorilla (see above). And all this to the creepy sounds of tinny carnival music fading in and out from the activated amusements surrounding you. If you ever find yourself in San Francisco, I simply cannot recommend this museum highly enough. Admission is free, but bring a bag of coins so you can plop them in watch each mechanical wonder lurch and illuminate into uncanny life. It is difficult not to be a bit mesmerized by these fascinating artifacts residing on the hazy border of the mechanized and the home-spun, artisinal craft and technology, the quaint and the macabre, as salacious and gruesome, in their way, as the products of contemporary technology, yet with an unexpected and seductive charm. All the images you see above are of the attractions of the Musée Mécanique, which I have been photographing over the course of many years and with many cameras; the gif animations are provided to demonstrate movement (though they are moving a bit more frenetically than the originals!). These selections do not nearly do justice to the Musée's vast collection; click here to see more images. 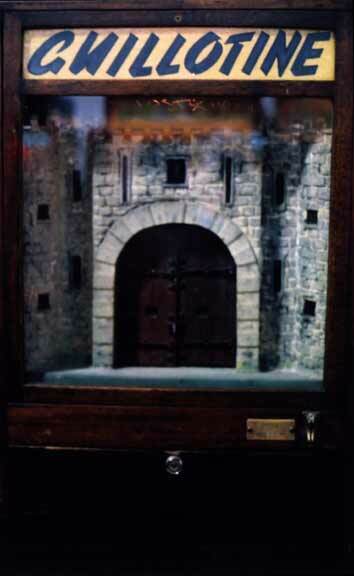 To visit the Musée Mécanique website, click here. For video of some of the attractions, click here. 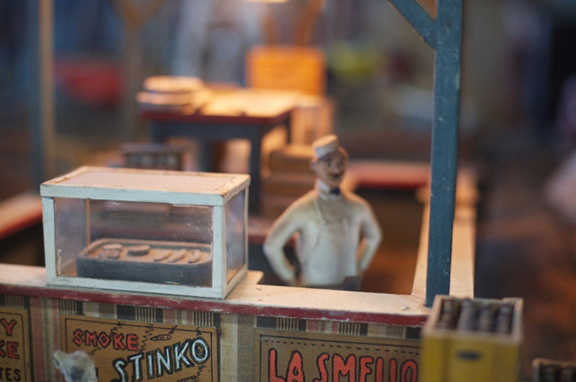 Better yet, go visit the Musée Mécanique in person! Now, I admit that the museum--which used to reside in a dark, furtive room on a cliff overlooking the ruins of the amazing 19th Century pleasure emporium The Sutro Baths*--has lost a bit of its charm since its recent relocation to bright, sanitized, crawling-with-tourists Fisherman's Wharf, but it is still truly awe-inspiring if a tad less magical. At least it has more visitors now, and is no longer in danger of closing. * If you are interested in the Sutro Baths, I invite you to stop by the Morbid Anatomy Library to see my book of historical images. Check it out here. More about this most wonderful of books here and here. 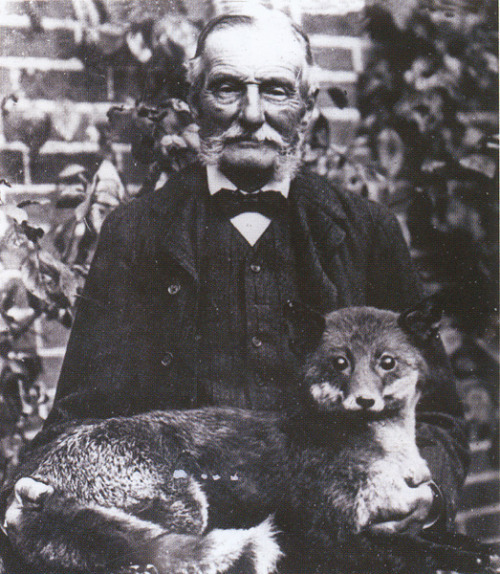 The image above is from the book and featured in the Discover Gallery. 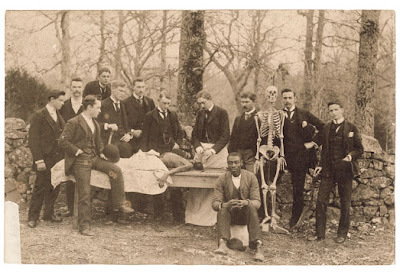 Caption reads: "Given the outdoor location of this "dissection," along with the students' unusually formal garb, we can be sure this procedure was staged by these students at the U of North Carolina Medical Dept., around 1890. The Seated man is the janitor; the overturned bucket he's sitting on was usually kept at the foot of the dissection table, and was used to collect waste." National Geographic just posted a short video about the amazing Paris Catacombs (as seen above) to their website. Entitled "Paris Catacombs 'Dense in Death,'" the video is esentially a narrated walk-through of this incredible site; a few too many tourists for my taste--just like in real life!--but a nice virtual visit nevertheless. Click here to watch the video; the image (which I urge you to click on for a larger view) is sourced from Atlas Obscura's entry on the Catacombs, which you can visit by clicking here . Via the wonderful Anonymous Works. There is a really exciting looking conference, entitled "Wax Moulages as Cultural Artefacts: Investigation, Conservation, and Restoration" taking place in Dresden, Germany, from September 24-26 of this year. Not only does this look to be a wonderful and thought-provoking multi-disciplinary conference but, even more wonderful--and highly unusual for a European conference--admission is free! I have just registered and will definitely be in attendance. Hope to see any of you like-minded folks there! 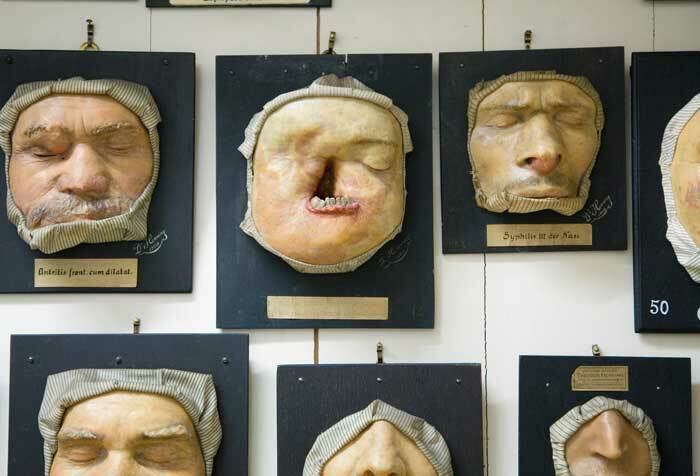 And, for those of you unclear on what medical moulage actually is, see above, wax moulages probably by Carl or Theodor Henning and housed in the Federal Pathologic-Anatomical Museum (Pathologisch-anatomisches Bundesmuseum) in Vienna, Austria, as featured in Anatomical Theatre. For more on moulage, click here. The international conference is devoted to interdisciplinary communication on the aesthetic, historical and physical properties of moulages, and will permit an exchange on the use, study, conservation and restoration of the moulage collections still extant throughout the world. Moulages, once a medium of medical documentation and education, are increasingly drawing the attention of international specialists. Through reinterpretation and reappraisal moulages have sometimes found their way into museums. Meanwhile, forgotten moulage collections continue to come to light. Many of these moulages are in a poor state of conservation. In many institutions the preservation of moulages is endangered. Conservation and restoration are necessary to combat this urgent problem. The collections concerned must first be closely examined, however. 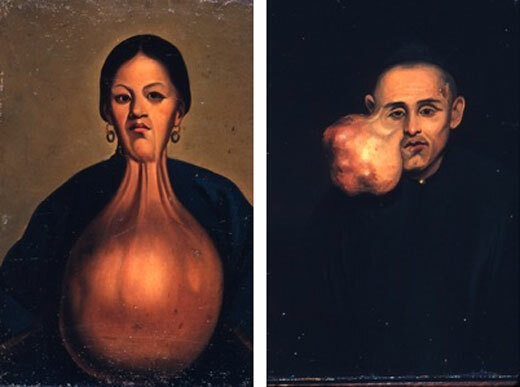 The conference will close this gap by presenting the first projects concerned with cataloguing and investigating the world's moulage collections, and with their use, restoration and conservation. The project Wax Moulages: Precious Craftsmanship In Danger of Extinction, funded by the German Federal Cultural Foundation and the Cultural Foundation of the German States, is among those presented. As part of that project, specialized restoration and conservation concepts will be developed on the moulages in the collection of the Deutsches Hygiene-Museum. The results will help to establish the first general standards and guidelines for the future conservation of moulages. The conference aims to bring together custodians of moulage collections, medical scientists and medical historians, furthermore conservators/restorers, conservation scientists and museologists as well as cultural scientists and curators. Full info (and sign up!) here. Hope to see you there. 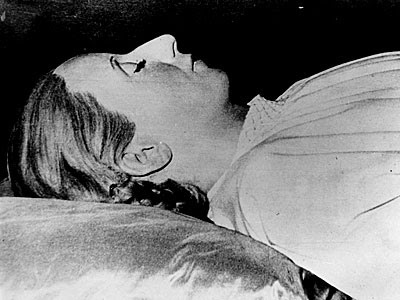 "An Iconography of the Flesh: The Bizarre Afterlife of Eva Perón" Lecture; Observatory Tomorrow Night! Full details following. Hope to see you there! When Argentine First Lady Eva Perón died in 1952, the intent was to embalm her body for display in a monument to the Argentine worker: a fitting tribute for the martyred patron saint of the working classes. This ambitious project—it was to be three times the height of the Statue of Liberty—was never realized, and when Perón was overthrown in 1955, the embalmed corpse became the new regime’s most stubborn problem and potent secret. In its thirty years in search of a permanent resting place, the embalmed body left a trail of death, insanity, and corpse-napping in its wake as Evita sympathizers sought to find the body of their saint and Evita’s enemies tried to keep the body’s whereabouts a secret. 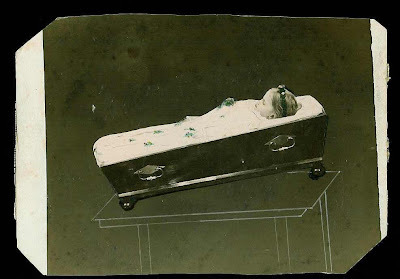 Professor Margaret Schwartz tells the story of the corpse’s afterlife and shows how Evita has stubbornly refused to die a proper death, thus rendering her corpse one of the world’s most unique and potent objects. You can directions by clicking here and find out more about Observatory by clicking here. "Classified: Contemporary Art at Tate Britain"
You can find out more, see more images, and watch a video about the exhibition by clicking here. But better yet, visit it in person, if possible. A small but lively and engaging exhibition. "Aphrodites of the Operating Theatre" Mark Dery on La Specola, et al. Why have we not developed an aesthetic of the inside of the body?," wonders one of the twin gynecologists in David Cronenberg's Dead Ringers. He speaks for Cronenberg, who took up the thread in an interview he and I conducted. "We have contests in which we decide who is the most beautiful woman in the world," said Cronenberg, "and yet, if you were to show the inside of that woman's body, you would have a lot of grossed-out people. Why is that? We should be able to have a World's Most Perfect Kidney contest, where women or men unzip to show their kidneys. We can't become integral creatures until we come to terms with our bodies and we haven't come remotely close to that. We're incredibly schizophrenic." Check out the whole post by clicking here. Regular readers have already noticed, no doubt, many mentions of a Brooklyn-based events space called Observatory (pictured above, hosting Michael Sappol's recent presentation on modernist anatomical artist Fritz Kahn). I have been remiss, however, in taking a moment to explaining what exactly Observatory is, and have been getting more than a few questions on the matter. So... here is the formal announcement: Observatory is an exhibition/classroom/event space in the Gowanus neighborhood of Brooklyn, New York which I founded earlier this year. Run by a myself and a group of six other artists/bloggers types (specifics on that here), the space presents programming inspired by the 18th century notion of “rational amusement” and is especially interested in topics residing at the interstices of learning and amusement, art and science, history and curiosity. Events thus far have spanned plant pressing workshops to lectures on anatomical waxes to antique science films; you can find out about many of our recent events here. These events promise to be great--hope you can make it to one or both! And be sure to arrive early as events often fill up. You can find more information about Observatory by clicking here; you can get directions by clicking here. You can join the Observatory Facebook Group by clicking here, and can get on our mailing list by clicking here. You visit Zoe Beloff's website by clicking here, and can read more about her fabulous Coney Island project by clicking here. I thought you would be interested in seeing this item I came across while on vacation last week. 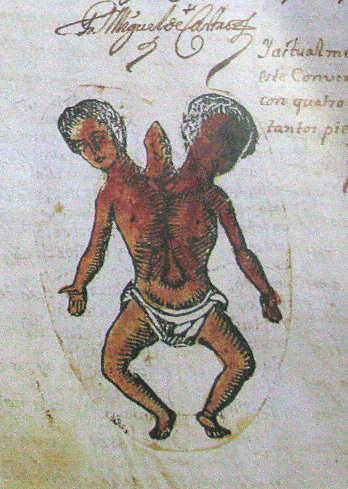 Attached is a picture of a manuscript about a girl born with two heads. 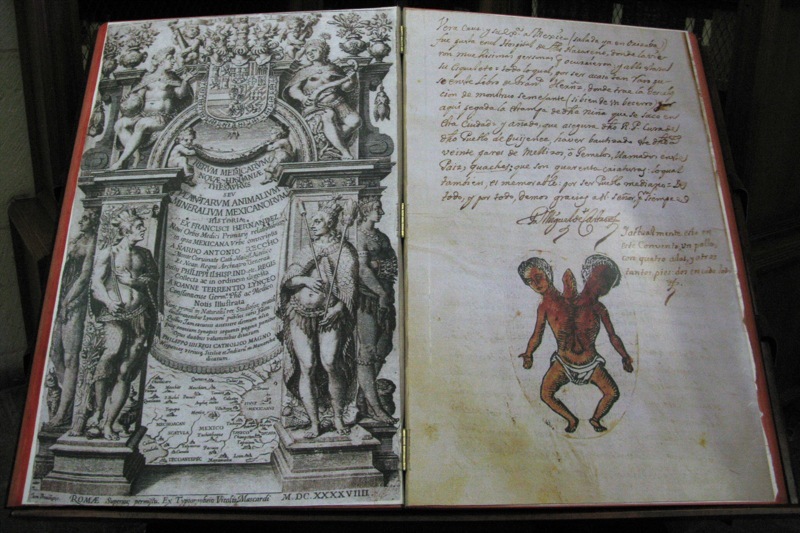 It is kept in the Biblioteca Francisco de Burgoa in the ex-monastery of Santo Domingo in the city of Oaxaca, Mexico. I'm guessing from the roman numerals on the bottom right of the left-hand page that it is from 1649. Unfortunately, it was storming, and the light was too low for me to be able to capture the script any better. The library is very beautiful, I recommend visiting if you are ever in southern Mexico. You can visit the website for the Biblioteca Francisco de Burgoa by clicking here. You can see some of Katherine's work by clicking here. Click on top image to see larger version. 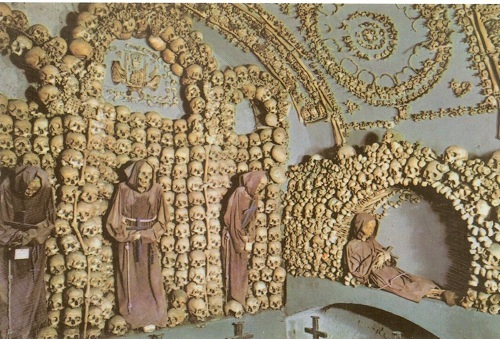 Mark Dery has just uploaded his latest fascinating Boing Boing guest-post which examines and riffs on the crypt of the Capuchin monks in Rome. His post begins "In the dream life of 18th and 19th Europe, Italy and the Gothic were conjoined twins..." And trust me--it just gets better from there. Click here to view the entire post. More on Dery's guest-blogging stint here . The amazing Wellcome Library (which I finally had the opportunity to visit this trip to London; more on that soon) has just made their collection of 16th Century anatomical fugitive sheets available on the web. Best of all, the online versions mimic the functionality of the originals; still images are available of the prints at each level of "dissection" (as seen above); you can also watch the prints self-dissect in short, time-lapse films, demonstrating the raising and and lowering of flaps with nary a human hand in sight. [Anatomical Fugitive Sheets] depict the human body through labelled illustrations, often using a three-dimensional 'pop-up' device of superimposed flaps, which can be raised in sequence to display the internal anatomy of the male or female figure. The fugitive sheet thus mimics the act of dissection. 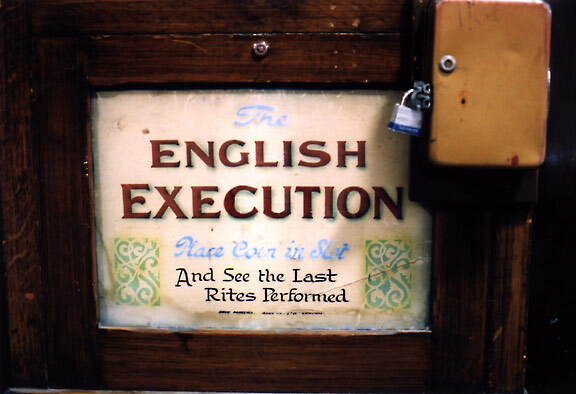 They were a popular instructional aid in the 16th century and many were produced in vernacular languages which could be read by a lay audience interested in the workings of the human body. 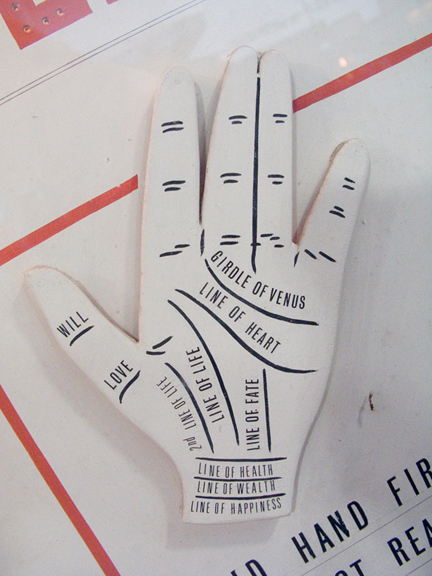 To read the full original post and learn more about anatomical fugitive sheets, click here. You can watch the videos by clicking here. 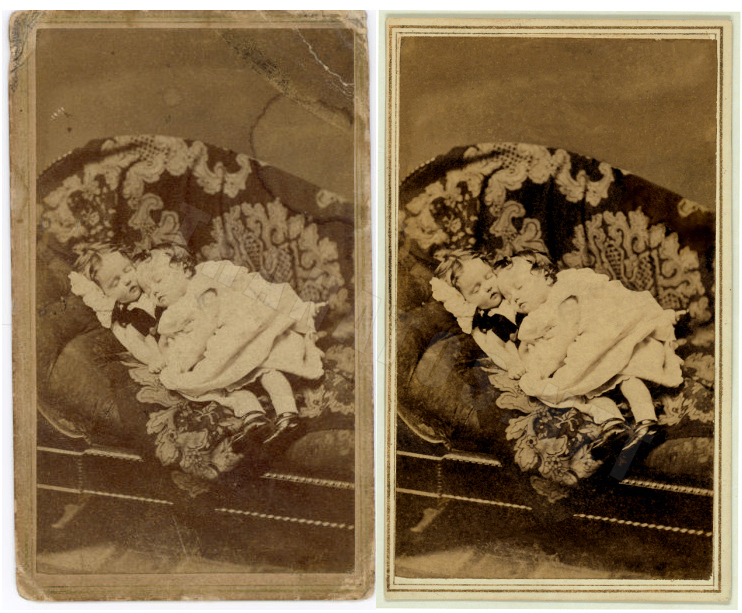 You can view the still images by clicking here and typing in "anatomical fugitive sheet." If you have not already done so, do hop over to Boing Boing to check out author and cultural critic Mark Dery--who you might recall from this previous post--as he guest posts on the blog about his Italian Grand Tour of the Pathological Sublime. My favorite entry thus far is called "A Young Person's Guide to the Pathological Sublime" and touches on--among other things--the Lam Qua paintings (see above, from post), Mütter Museum photography, and the fine flickering line at the edge of spectacle and edification. Not to be missed! Click here to visit the post. You can view the complete Yale Lam Qua collection, commissioned by Peter Parker (but not that Peter Parker! ), by clicking here. 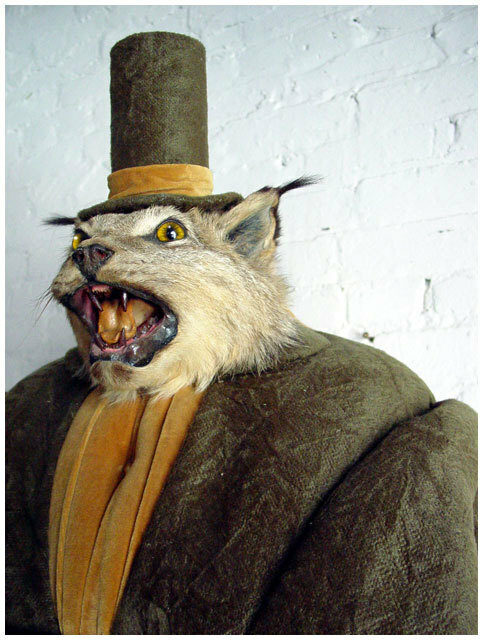 My friend Kelli just alerted me to a new, great, and somewhat misleadingly named website: Crappytaxidermy.com. Ostensibly a collection of crappy taxidermy, the website is much more than that and far better and broader than the name suggests; it is in fact a kind of visual collection of the many ways in which mankind's unending pleasure in preserving, depicting, and re-creating animals including taxidermy (crappy and otherwise), models, museum dioramas, and creative taxidermy is expressed. Endless fun to peruse, though--sadly--and my only complaint--no credits to find out photographer or artifact information. 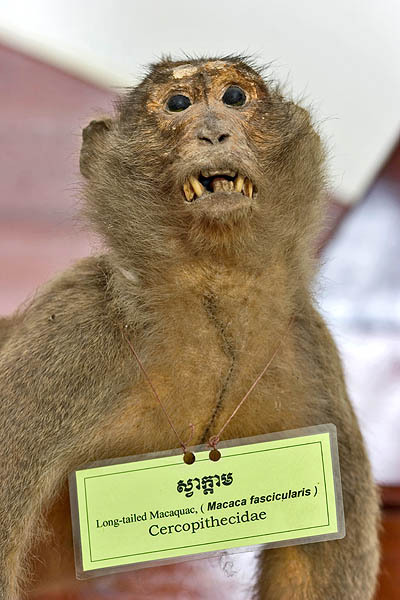 Click here to visit Crappytaxidermy.com. Thanks so much, Kelli, for sending this along. I just received an email from Morbid Anatomy reader Scott Holloway alerting me to an upcoming show of his artworks inspired by anatomical and religious works that will be on show at La Lux de Jesus Gallery in Los Angeles from August 7 - 30. Scott Holloway’s current work centers on the holy relics of Saints and biblical figures as highly detailed anatomical icons. Holloway fuses these images with passages from the Bible and text from medical treatise, sprinkled with a bit of Surrealism. Working with oil on panel as well as mixed media, Holloway’s pieces conjure up images torn from an old anatomy book, an icon that emerged from an unknown religion and skulls that remind us of our own mortality. Born in Bellingham, Massachusetts in 1969, Holloway discovered his talent at an early age. Encouraged by his teachers to pursue an art career, he explored realism in the tradition of the Northern Renaissance. His efforts won him several awards for his work in the late 1980s. 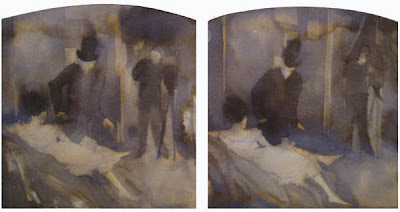 In the 1990s, Holloway spent four years studying the oil painting techniques of the Old Masters at Montserrat College of Art in Beverly, Massachusetts. Since then, Holloway has been working steadily from his studios in Worcester, and exhibiting his work at area galleries as well LA, NYC, Berlin and London. “I love to work with concepts. I have also created a Madonna and Child series. These works at first appear to the viewer as religious icons. But if you look closer, you will notice I have included an underlying ‘femme fatale’ theme using a lot of ironic symbolism” states Holloway. To find out more about the show, click here. 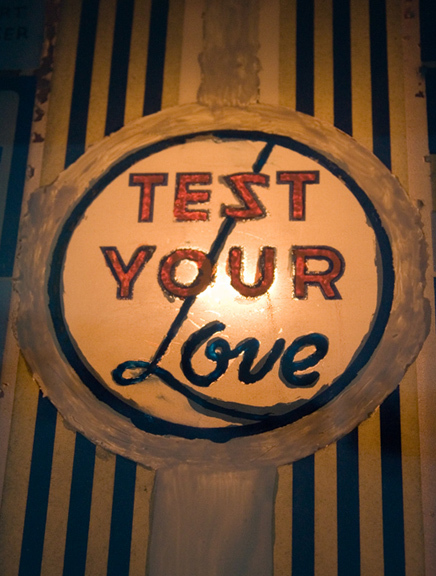 To see more of his work (as shown above) click here.